Former Vice President Joice Mujuru has for the first time confirmed that she is leading the opposition Zimbabwe People First (ZPF) expected to contest the country’s much-anticipated 2018 general elections,Voice of America has reported. She had come under fire from some political analysts who accused her of leading from the back and speaking only through proxies. 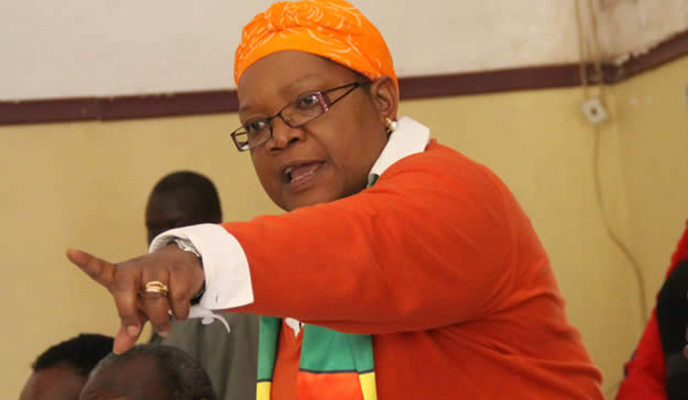 Mrs. Mujuru, who on Friday registered her own political party – ZPF – says she is now ready to lead the party. “We are pleased to announce the formal registration of Zimbabwe People First as a political party through the lodging of the constitution of the party with the Zimbabwe Electoral Commission (ZEC) on the 12th of February 2016”. Mrs. Mujuru is a former guerrilla fighter from the liberation war in the former Rhodesia and the widow of former army commander General Solomon Mujuru, who died in a mysterious house fire in 2011. After holding cabinet posts in successive governments since independence in 1980, Mrs. Mujuru came under heavy attack from President Robert Mugabe’s wife, Grace, who was promoted to head the ruling Zanu-PF’s powerful Women’s League. The former vice president, who turns 61 in April, was accused of “plotting to unconstitutionally remove President Robert Mugabe from office”, according to a statement from Zanu PF spokesman Simon Khaya-Moyo released in April, 2015. Addressing journalists at the Zanu-PF Harare Headquarters after the party’s Politburo meeting, Moyo said the decision had been reached after wide consultation. “The grounds for Joice Mujuru’s expulsion from Zanu-PF included but not limited to the following; plotting to unconstitutional remove the President and First secretary of the party from office: orchestrating the ‘bhora musango’ campaign to the detriment of the party’s interests, orchestrating factionalism in the party thereby causing acrimonious divisions; abusing party structures to create a competing center of national power; engaging in behavior unbecoming of a vice president and second secretary of the party; systematically collaborating and colluding with the enemy in a manner that undermines the party to risk bringing it into disrepute; engaging in activities that smack of corruption; engaging in criminal abuse of office; impugning, maligning and undermining the party and the president and providing leadership to the regime change and fifth column politics within ZANU-PF”. Mrs. Mujuru has consistently denied all these allegations. Mrs. Mujuru was long considered a likely successor to Mr. Mugabe, who turns 92 this month before falling out of favor. Mr. Mugabe replaced her as vice-president with his justice minister Emmerson Mnangagwa, who has also come under fire for allegedly plotting to remove him from power. Again First Lady Grace Mugabe is leading the charge against Mnangagwa. Addressing thousands of Zanu PF supporters at Kanyemba School in Chiweshe, Mashonaland Central Province, Mrs. Mugabe said President Robert Mugabe is not happy with growing factionalism in his party. Mrs. Mugabe took a swipe at the so-called Team Lacoste, a Zanu PF faction allegedly led by Vice President Mnangagwa, saying the camp is fueling divisions in the fractious ruling party. Mnangagwa is reportedly angling himself to succeed President Mugabe when he eventually leaves office. Mrs. Mugabe told supporters – without mentioning names – that some people in Zanu PF have too much zeal for power in such a way that they now want to remove President Mugabe from his position even through illegal means. She declared that Mr. Mugabe will contest the 2018 elections representing the party. Party chairperson from Mashonaland East, Masvingo and Midlands, who are Mnangagwa’s close allies, were suspended Sunday for allegedly fanning factionalism. Mrs. Mujuru says she is not surprised by the escalating tensions in the ruling Zanu-PF party.